At its annual I/O developer conference, Google on Wednesday revealed a new smart speaker that houses its “OK Google” digital voice assistant, offering one of the first major competitors to the Echo. The plug-in speaker, coming out later this year, will be able to play music and connect to devices around the home. The Home, along with the new Allo messaging app, will be some of the first new places Google will be putting its more robust Google digital assistant so it can provide natural two-way conversations with users. Google’s entry underscores the notion that the home has increasingly become a battleground in tech, with companies scrambling to gain a piece of a new market that includes biometric door locks and refrigerators plastered with tablet screens. After launching in late 2014, the Echo has become a sleeper hit, with the cylindrical speaker letting people to use voice commands to control their connected lightbulbs and thermostats, order Domino’s pizzas or check their bank balance. Thanks to all its features, the Echo has enjoyed early success as a hub for the connected home, with Amazon selling an estimated 3 million devices so far. But Google likely wants to deny Amazon that lofty position. Google’s parent Alphabet already spent $3.2 billion to buy Nest, which makes connected smoke alarms, webcams and thermostats, and Google would rather its hub — not the Echo — operate these products. Google and Amazon also have become fiercer rivals, with the tech titans fighting over consumer electronics, grocery deliveries and cloud storage services. Google Home, which was rumored to come out, provides yet another battlefront. Google’s advantage in this fight could be its large portfolio of popular apps, including Google Maps, Google Photos and Google Calendar, as well as Nest’s smart-home devices. Also, Google’s digital assistant, known as “OK Google” or Google Now, already resides in Android smartphones and the Google search app. Having a device that can bring all those items together in an easy-to-use, voice-controlled speaker could give the Echo a run for its money. For example, Google executives said people will be able to use the Home to control their Nest devices or play music in different rooms using speakers enabled with Google Chromecast Audio. The Echo, though, already works with Nest devices and Google Calendar, and includes more than 300 different capabilities, from reading Bible verses to ordering an Uber car. An Amazon representative didn’t immediately respond to a request for comment for this story. 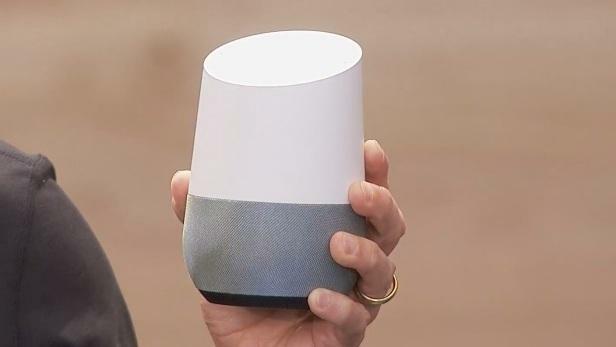 The Google Home can be personalized with different materials and colors, and may let users ask a broader range of questions than the Echo can manage, since Google’s digital assistant connects to the company’s powerful search platform. With the help of machine learning, the Google assistant will improve over time by learning a specific user’s preferences and patterns. While “OK Google” will start as the Home’s wake word, other options like “Hey Google” will be added. Users will have the same privacy controls as they do with Google search histories, with users able to delete some or all their queries to the Google Home. Google’s new speaker increases the chances that devices will have more voice controls going forward, which could help people navigate complicated sets of commands without having to use a remote or touchscreen. Apple has worked to add its Siri digital assistant into more devices, as is Microsoft with its Cortana platform.